In a previous post, I introduced the Strategic Media Access Resource Team, or “SMARTeam” for short: the intrepid crew responsible for getting audio and video media ready for MDPI to reformat. The preparation work they do involves a number of tasks—each item needs to be physically barcoded, for example—but none is more critical, or more demanding, than sorting by technical characteristics. The efficiency of parallel reformatting depends on having a supply of carriers that can be played on the same equipment with minimal adjustment, and that will each run for roughly the same length of time with no stragglers to hold things up. Of all the audio and video formats the SMARTeam has had to sort by technical characteristics, the most challenging has been open reel audio tape, partly because of the sheer number of factors in play, and partly because some of the distinctions aren’t visible to the naked eye. 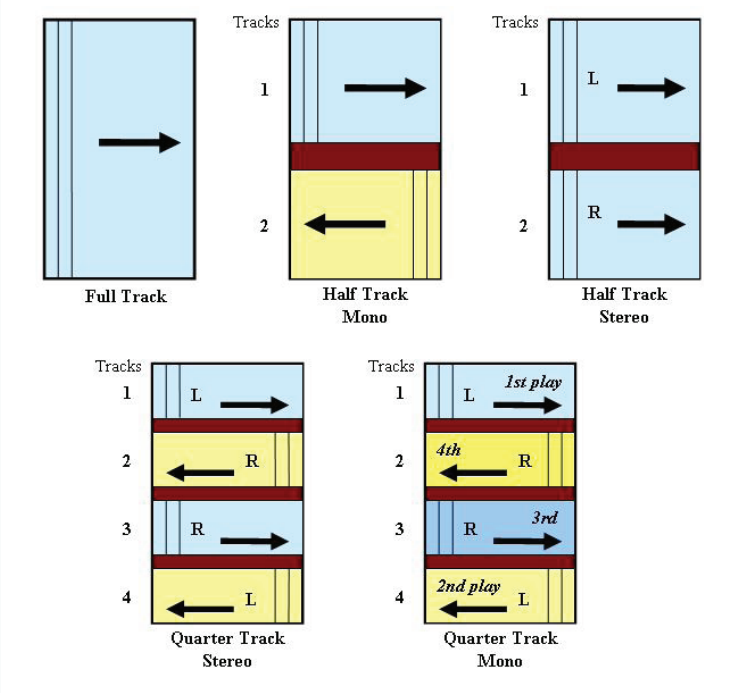 Consider track configuration—how the magnetic signal is arranged on the tape. Does one track take up the whole width of the tape, or are there two different tracks side by side, or four? And if tracks come in pairs, there’s a further question of sound field: are they two halves of a stereo recording, separate mono recordings, or duplicates of the same mono recording? If the metadata for a tape says it’s mono, and you play it as mono, but it’s actually stereo, you won’t notice that anything’s wrong—but you’ll lose all the stereo information. So it’s important to make this call correctly ahead of time and to route each tape to a machine with the right kind of playback head. But the SMARTeam ordinarily relies on quick visual inspections, and if you’re just holding a reel of tape in your hand, different track configurations won’t look any different from one another. Another important factor is speed, or how fast the tape moved past the head during recording. In the United States, this is generally given in inches per second or “ips.” The options fall into a tidy geometric sequence—30, 15, 7½, 3¾, and so on—and a tape recorded at 15/16 ips will play for thirty-two times as long as a tape recorded at 30 ips, all other things being equal. But you can’t tell the speed of a tape just by looking at it. Another factor is the tape stock, a distinctive tape formulation identified by company name and product number. Some polyester stocks are known to suffer from sticky shed syndrome, a problem that causes them to stick, squeal, and shed during playback, but which can be cured temporarily by baking at low temperature. We want to separate out all stocks on the sticky-shed list to be routed for baking. Meanwhile, other stocks that occasionally stick and squeal—such as Scotch 175—don’t respond to baking, and it’s not good for a tape to be baked needlessly as certain types may be harmed. We try to separate out these stocks too, so that nobody tries to bake them even if they have problems. Alas, tape stocks can’t always be readily identified. The stock type was usually printed on the containers in which tapes were originally sold, but sometimes tapes have been put in new containers, had their boxes switched around, or otherwise had this information obscured. Thickness can be measured with calipers, and acetate stocks are translucent, but beyond that, the SMARTeam can’t reliably recognize a random tape stock just from its appearance. 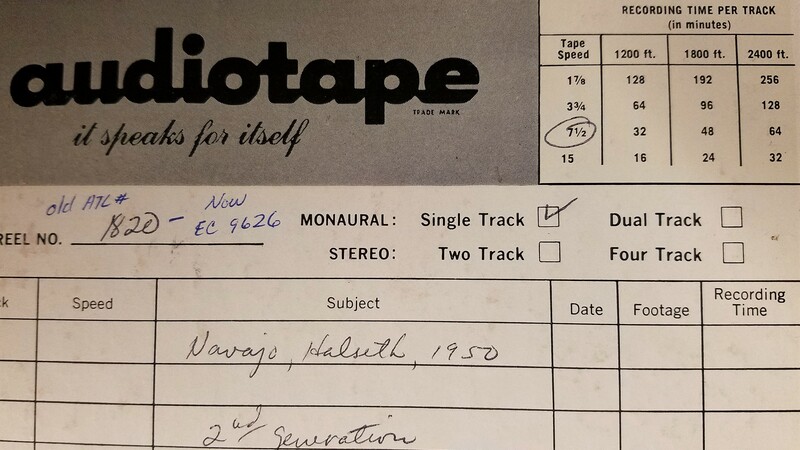 Fortunately, the people who recorded open reel tapes often documented details such as track configuration and speed in writing—in fact, many boxes were pre-printed with checkboxes and blanks for keeping track of that information. Sometimes engineers who’d played the tapes in the past took notes about technical characteristics and problems as well. Much of the risk assessment work that preceded MDPI involved collating this data for reference and analysis. When the SMARTeam began sorting open reel tapes for reformatting a couple years ago, these are the sources of information they used. 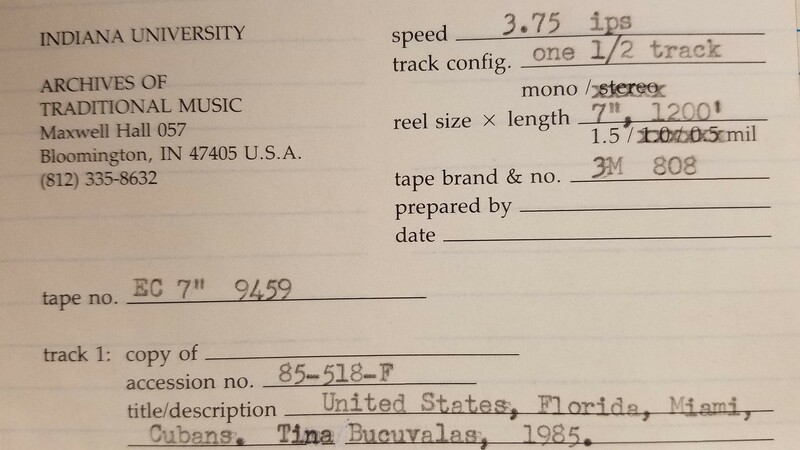 First up for digitization was a run of Jacobs School of Music performance tapes with wonderfully consistent and well-documented technical specifications. Nearly all of them were recorded at the same speed, and tape stocks and sound fields were mostly consistent by time period. Everything went swimmingly. But then we moved on to some collections recorded under more varied circumstances, for instance by ethnographers doing fieldwork in various parts of the world. We knew that we’d encounter some tapes with unknown technical specifications and would need to find some way of dealing with those. However, we were surprised at how many tapes with technical metadata present instead had their specifications documented incorrectly. Information we thought we had safely in hand turned out to be wrong, which took a heavy toll on productivity. It was clear we needed to try some new approach to sorting—and that will be the subject of Part Two. In 1892 or 1893, Army surgeon and amateur anthropologist Washington Matthews recorded his first cylinders while working with the Navajo people in New Mexico. Matthews was already well-established as a researcher of native American traditions when he was deliberately assigned to Fort Wingate so that he could study Navajo culture. His recordings are likely the earliest of the nearly 7,000 cylinders held at the IU Archives of Traditional Music. Indeed, they are only a few years younger than the oldest field recordings known to exist anywhere—the Passamaquoddy cylinders recorded by Jesse Walter Fewkes in March 1890. By all accounts, Matthews’ work was considered meticulous, systematic, and a model for a long line of Navajo researchers who followed. It is somewhat daunting to be tasked with developing a workflow to digitize recordings of this age and significance. Although all points in a cylinder digitization workflow are important, perhaps the most critical issue is selecting the playback machine. 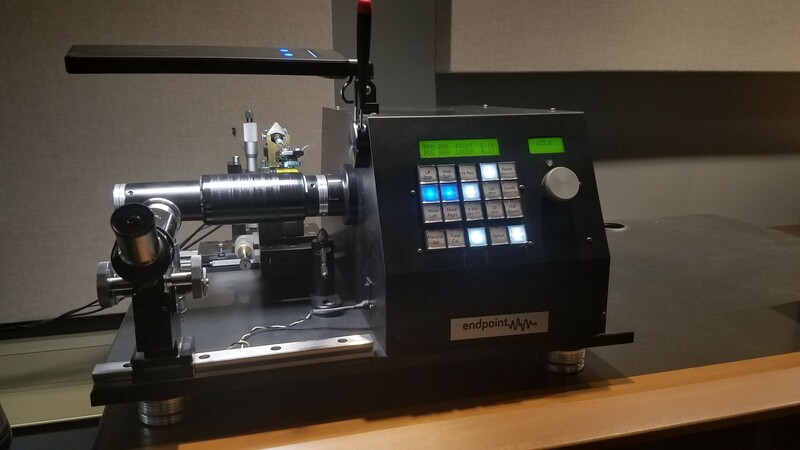 The Endpoint Audio Labs cylinder machine represents a significant advancement in cylinder playback technology with many features that enable a more accurate representation of the recorded content than was previously possible. For example, a laser mounted below the tonearm takes measurements to the surface of the cylinder at different points around the circumference. It provides a readout that enables us to center the cylinder playback mandrel precisely according to the shape of each cylinder. This is necessary because cylinders can become misshapen over time resulting in wow and flutter—a ‘wavering’ sound from speed fluctuations—during playback. Dan Figurelli adjusts the mandrel in preparation to play a cylinder. The problems caused by misshapen cylinders are sometimes greater than we are able to compensate for with the laser. The Endpoint machine also outputs a 440 Hz reference tone that is modulated by the cylinder surface distance readings taken by the laser during playback. This reference tone can be used in software such as Capstan to remove any further wow and flutter. 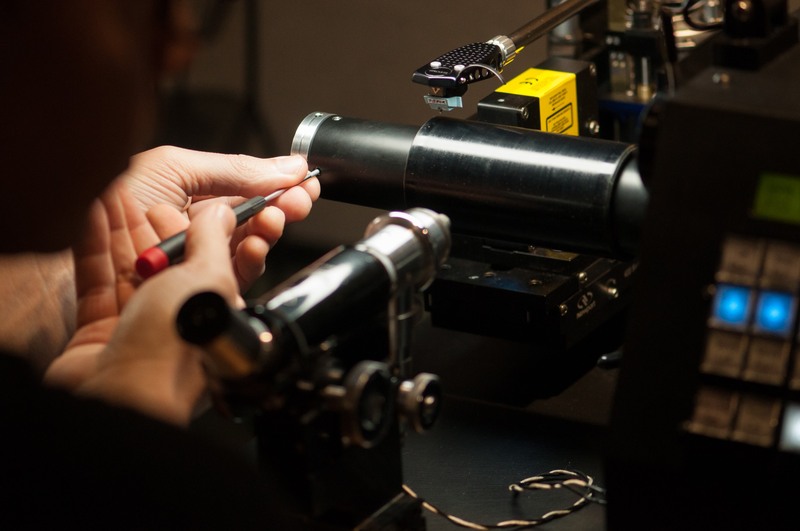 The Endpoint machine also has a microscope for inspecting the individual grooves of a cylinder. This is helpful when we’re developing strategies for playing cylinders with tracking issues, locked grooves, and cracks. Plus, cylinders look really cool close up! 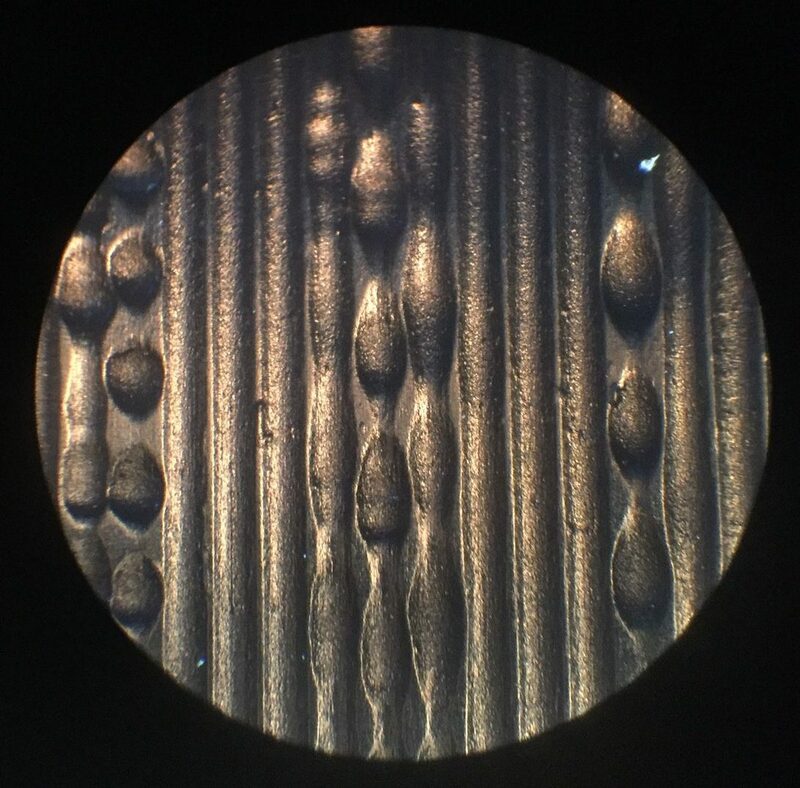 Cylinder grooves as they appear under the Endpoint machine microscope. The larger oval shapes are louder sounds on the cylinder. Field-recorded cylinders can come with a whole host of tracking problems. The grooves are shallow, which makes it easy for a stylus to “skate” along the top of the cylinder with any surface bump, chip, warp, or oddly-cut groove it encounters. Cracks in the cylinder itself also can send a stylus out of the groove. Playing back a cylinder at half speed may resolve many of these issues, and the Endpoint cylinder machine has a handy half speed button that allows us to find the correct speed for the cylinder and then halve it directly, rather than scrolling through the speed range to find half speed manually. It also has the ability to raise or lower the pitch by one semitone at the touch of a button. This is useful when we’re trying to determine the best playback speed. Dan Figurelli centers a cylinder on the Endpoint machine. The Endpoint machine also gives us the ability to capture more content than with previous transfers. A perfectly cut cylinder in good shape will usually play from beginning to end without a problem, but many cylinders are out of round or have grooves that are locked or oriented in the reverse direction, or that fall right off the edge of the cylinder! Bergh’s machine allows us to take the mandrel off and set it in the reverse direction so that we can approach a locked groove from both sides, capture backwards content, and access grooves cut into the outermost edges. This ensures that we can digitize every groove of a cylinder, capturing its content completely. 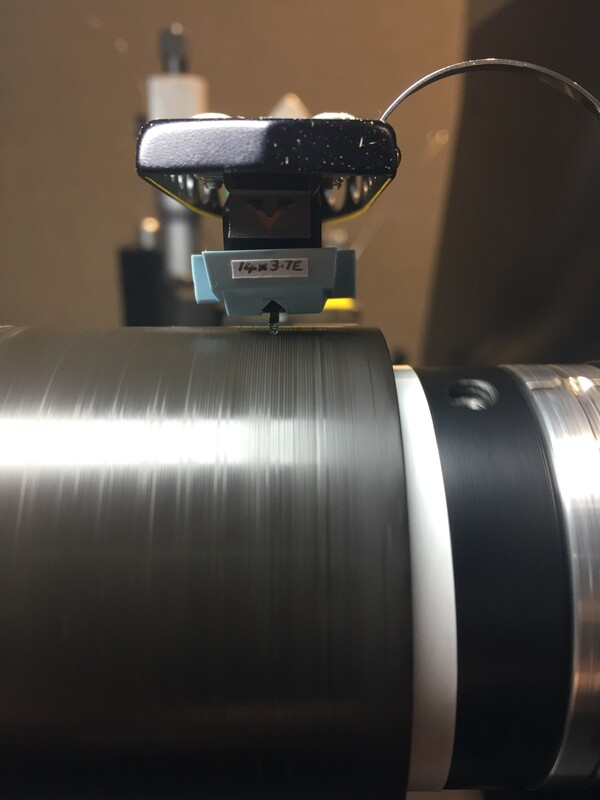 Stylus making contact with cylinder grooves on Endpoint machine. Finally, in our tests and measurements of machine noise, rumble, and wow and flutter, the Endpoint machine performed better than the other stylus-based devices we examined. It also appeared to provide more overall clarity. Washington Matthews’ work with the Navajo in the late nineteenth century has been cited as “meeting the highest standards of accuracy and completeness.” We believe that Nick Bergh’s new cylinder playback machine provides us with an excellent tool to capture the recorded output of Matthews and other fieldworkers accurately and completely for long-term preservation. Melissa Widzinski adjusts the mandrel for playing back a brown wax cylinder from the 1890s. Washington Matthews’ Folklore Studies, Katherine Spencer Halpern, in Washington Matthews: Studies of Navajo Culture, 1880-1984, page 98. 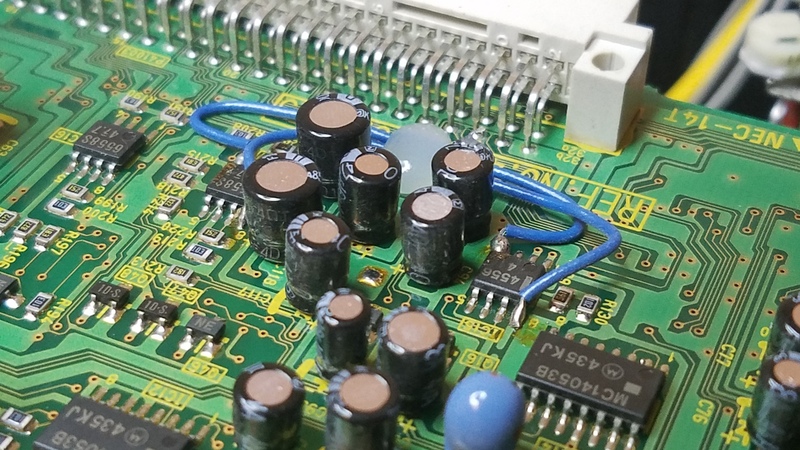 Obsolescence in Action: How Fast Can You Solder 2,400 capacitors on 12 VHS Machines? In the early days of MDPI, I came across a university in Ohio that was looking to dispose of twelve Panasonic AG-DS840 VHS machines. High-end VHS machines, free for the taking if we’d pick them up. At the time I was just beginning to work with Andrew Dapuzzo, director of US operations for Sony Memnon. I knew he was looking for machines like this as Memnon was tooling up to install video parallel transfer workflows. Perfect, I thought—what a great way to get our relationship off to a good start. I gave him the contact, and a week later he loaded up his rented truck with his daughter, his wife, and his dog and headed off to Ohio. What could possibly go wrong with this endeavor? The machines made their way to Bloomington and were presented to Ken Falls, the MDPI facility’s maintenance engineer. I remember Andrew telling Ken that these were great machines that reportedly all worked when taken out of service a number of years ago. He thought that maybe now one or two of them would need a little attention. Two days later, Ken called Andrew to his work space. “Andrew,” he said, “not one of these will power up.” Andrew didn’t believe him at first but after some talking and tinkering it was clear that all twelve were dead. So much for my grand plan to get on Andrew’s good side. Efforts to troubleshoot began. 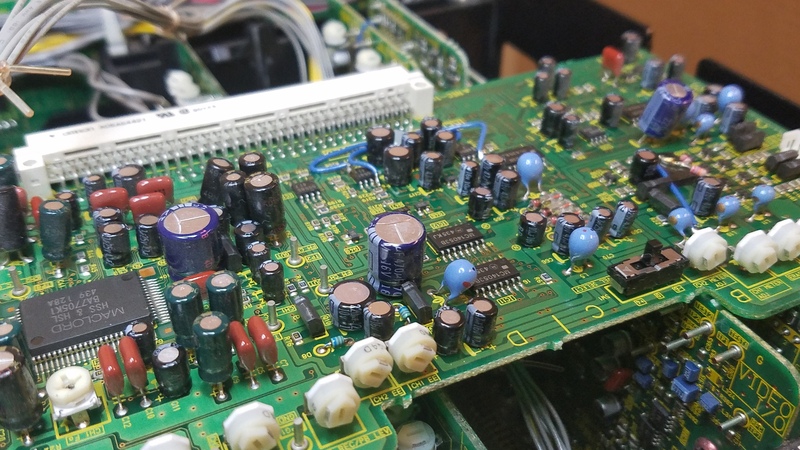 It turned out that every capacitor—some 200 on each machine—had dried out. Apparently, this is an occupational hazard for some types of old video playback machines. Well, Andrew knew a guy who knew a guy who could do the repair work, removing each capacitor and soldering on 200 new ones for each machine. It cost some money, but eventually all twelve machines came back to life. This is how we exist in the world of obsolescence that media preservation inhabits. Most old machines need to be repaired and/or refurbished. Machines constantly require attention from Ken, ranging from some annoying little issue to a catastrophic problem that puts it out of business. The maintenance and repair budget grows every year while our cash shrinks as we cope with persistent and reoccurring repair issues. We have lots of little stories like this. We’ll keep sharing them from time to time. Welcome to the second post in our series about MDPI and metadata! Last time we discussed the overall sources of metadata for MDPI items and the topics we would cover more in-depth later in this series. 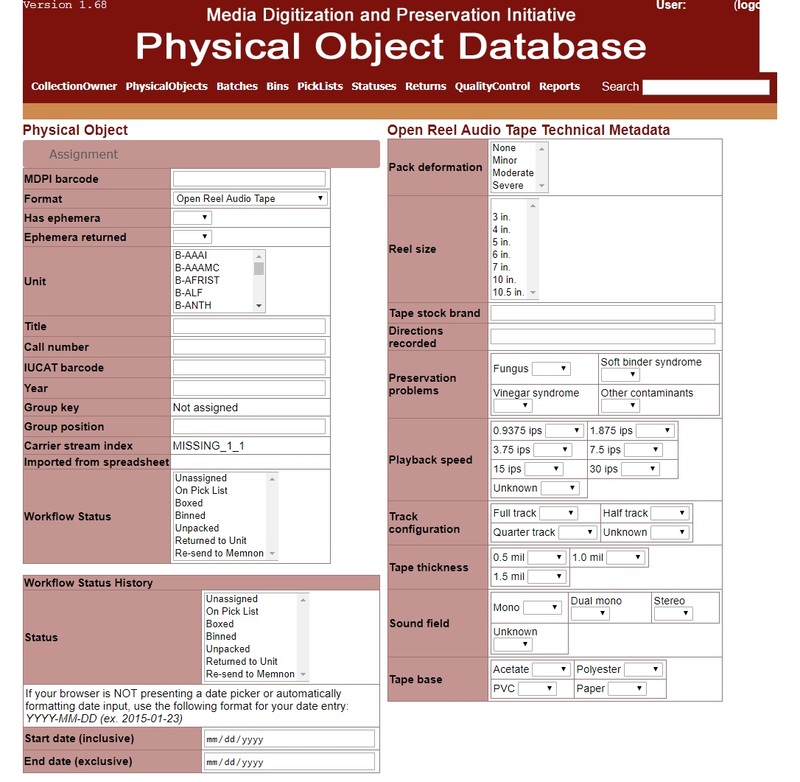 Today’s post will cover metadata used to track physical items through the MDPI digitization process and to document characteristics and problems with the recordings. 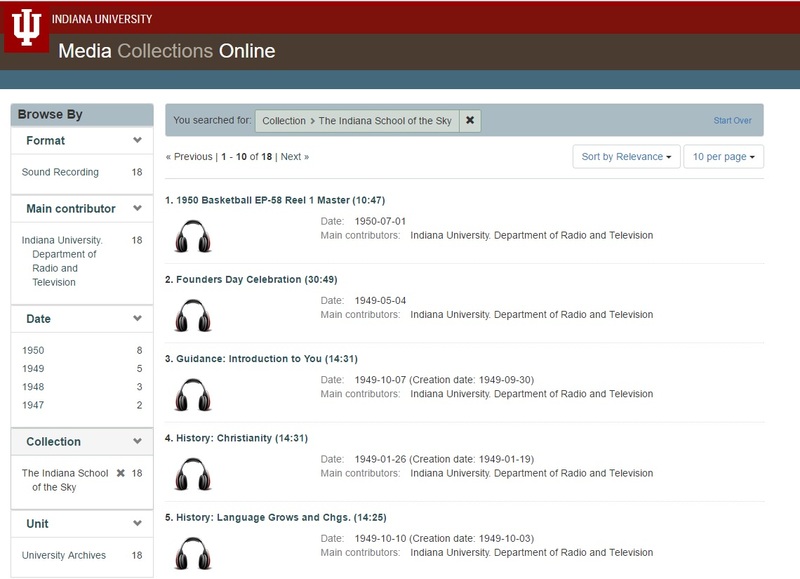 The Physical Object Database (POD) was developed by IU Libraries to track administrative details for every physical object that goes through MDPI digitization. This includes when it’s assigned a barcode; details about its condition; what box, bin, and batch it goes in for shipping; when it’s sent for digitizing; when it’s checked in after being digitized; and when it’s returned to its home unit. Additionally, if the recording doesn’t have a library catalog record in IUCAT, we have fields we can use to enter some descriptive details in the POD. These tend to be limited to a title and a date—typical of what is found in notes on the recording or its container—to which we add shelf or call number and collection identifier if available. The function of descriptive metadata at this stage is mainly to enable digitization staff to confirm that they are working with the right recording. Every physical item in MDPI receives a scannable barcode on the packaging containing the item. LP jackets, audio cassette cases, and CD-R jewel cases all receive barcode stickers that identify the physical item inside as being part of the MDPI process. These containers with their items are loaded into plastic bins (sometimes also packed within boxes inside those bins). Multiple bins are gathered together in batches by format (LPs or audio cassettes or VHS tapes, for example) and driven by truck across campus to the digitization lab. We produce a spreadsheet shipping manifest that contains all the barcodes for a single batch along with descriptive and technical metadata. The barcode number is used as the base of the file names for the digital files for that item, so that when it’s returned, the collection manager will know which digitized files represent which physical items. Descriptive information such as a title might also help but this may not be known—and in any case, filenames that include descriptive metadata probably wouldn’t be sustainable for providing unique identification of files given the very large size of our holdings. Each physical format digitized in MDPI has different physical characteristics that are tracked in the POD. For open reel audio tapes, for example, we gather metadata on reel size, playback speed, track configuration, sound field, tape brand, and tape base. We also gather metadata on various problems that can be seen: are there tape pack problems, fungus, vinegar smells? This data is collected by the prep staff during a visual inspection of each tape and box, and it gives useful clues to the digitizers about what to expect during processing. This information also becomes part of the recorded history of the object. If the digitizers find other problems or discover inaccuracies, they can edit the POD record or—in the case of Memnon—provide updates in the XML that they deliver. Including these details as part of the record for a digitized item provides useful information to researchers to help them understand and interpret the source recording and the resulting digital file(s). Digitization staff also provide comments on condition and problems observed during playback as part of the digital provenance metadata that is created. All of these provide confidence that digitization was handled as accurately as is possible with a deteriorating recording and that these problems were specifically addressed. Therefore, researchers should not need to question whether something went wrong or was missed during digitization if the problem in question is documented in the metadata. We hope this post about metadata for tracking physical items through the digitization process has been an interesting and informative read! Join us for the next post in this series when we discuss metadata issues surrounding long-term storage for digitized audio and video. When is Betamax Not Betamax? MDPI has a ravenous appetite. To keep all its lines running at capacity, it needs to be fed around three thousand media objects per week. The stalwart band of workers responsible for dishing up the necessary diet of tapes and discs is known as the Strategic Media Access Resource Team—the “SMARTeam” for short. And when it comes to wrangling masses of outmoded media, there’s nobody smarter. These folks know their VHS from their U-matic, their Type I audiocassette from their Type IV, their microgroove from their coarse. They’re savvy about speeds and track configurations and sound fields, and they could rattle off the product numbers of sticky-shed tape stocks in their sleep. However, they rely almost entirely on visual inspection. They look closely at each object as they prepare it, maybe going so far as to hold it up to the light to check for translucence, and they also study whatever’s printed or written on it. But with rare exceptions—limited to CD-Rs and DATs—they never actually put anything into a machine. Usually this works out just fine, but not always. After all, some formats are masters of disguise! Consider Betamax, a consumer videocassette system introduced in 1975 and remembered today mostly for having lost the videotape format war to the rival VHS format. Last August, we delivered a batch of tapes to Indiana University Media Digitization Studios (IUMDS) for reformatting that looked all the world like Betamax. They displayed the distinctive Betamax logo, the cassettes had the expected design, and the curatorial unit they’d come from had identified them as Betamax. But when these tapes reached MDPI video preservation engineer Rob Mobley, we were in for a surprise. The recordings on the tapes weren’t Betamax, he told us, but Betacam—a higher-resolution format intended for broadcast and professional use. When Sony had launched the first Betacam system in 1982, it had offered a new line of cassettes manufactured especially for it. These tapes are clearly labeled and easily recognizable; the SMARTeam knows them well as “Betacam Oxide.” However, it turns out that some users had substituted Betamax cassettes in their Betacam recorders. Sony discouraged the practice—the newer cassettes had been designed more robustly to support the higher tape speed of Betacam—but it was possible because both cassette types used the same ferric oxide tape in a shell of the same basic structure. Of course, a Betamax tape with a Betacam recording on it looks exactly like a Betamax tape with a Betamax recording on it. There’s no way to tell the two apart through visual inspection. In effect, we’d been fooled by a bunch of Betacam tapes cunningly disguised as Betamax. Since the MDPI workflow for Betacam is entirely different from the MDPI workflow for Betamax, this meant everything had to be re-prepared. And our Betamax woes didn’t end there. What we’re looking at here isn’t video at all, but audio. In 1981, Sony had introduced a digital audio processor called the PCM-F1. Priced at $1900—a fraction of the cost of earlier PCM adaptors—it was the first widely affordable processor for digital audio recording. But it had no built-in recording mechanism of its own. Instead, it had to be connected to a separate videotape recorder, the only kind of recording device available at the time that could handle the serious bandwidths involved. Digital audio data coming out of the PCM-F1 would be recorded as a video signal made up of monochrome dots and bars, and this video signal could then be played back through the PCM-F1 and reconverted into audio. Any kind of videotape was theoretically fair game, but in practice Sony PCM-F1 machines were most often paired with Sony Betamax decks. This cumbersome arrangement was superseded by the more familiar DAT format in 1987. We’d known from our Media Preservation Survey that there were PCM-F1 recordings on Betamax cassettes at the Music Library and in the Recording Arts program. But a Betamax tape with a PCM-F1 recording on it looks exactly like a Betamax tape with a Betamax recording on it, so with the Indiana Fiddlers’ Gathering tapes we’d been fooled yet again. You can’t judge a Betamax cassette by its cover. At 16, he conned his way onstage in Ireland by pretending to be a cigar-smoking Theater Guild actor on vacation. He debuted on Broadway at 19, and co-founded his own experimental theater company soon after, which he then took to radio. There he adapted one sci-fi story into a startlingly realistic newscast-style performance as a Halloween prank—terrifying tens of thousands in his audience and launching a national media scandal along with his popular profile. By the time he was 25, Orson Welles was a prodigious performer and producer in all media except film. One year later, he would release his first feature-length movie, “Citizen Kane,” which is widely considered the greatest film of all time. While his films still grace movie shelves and streaming queues, one side of his career has remained mostly the province of scholars and enthusiasts. Only piecemeal selections of his radio work are widely available, much of it only in low-quality audio. IU Libraries’ Lilly Library safeguards one of the largest troves of recordings from Welles’s radio career. Now, with a $25,000 grant from the National Recording Preservation Foundation and the expertise of IU’s nationally recognized Media Digitization and Preservation Initiative (MDPI), the original sounds of Orson Welles at the apex of radio and his career will once again find an audience. In the late 1970s, longtime Welles associate Richard Wilson wanted a good home for his collection from Welles’s radio career, which filled his garage in California. The Lilly Library happily obliged, acquiring box after box of production materials and scripts, along with hundreds of lacquer audio discs of Welles’s broadcasts. A lacquer disc being transferred at Indiana University’s Media Digitization and Preservation Initiative. Recorded live to disc on a lathe, the discs are invaluable, but actually hearing the collection used to be cumbersome. Lacking facilities dedicated to audio scholarship, Lilly’s librarians had to determine the logistics of listening on a case-by-case basis. MDPI was created to streamline digitization of such collections, making it possible to publicly share treasures like Welles’s radio shows, but also freeing scholars from logistical barriers to their research. Once digitized, the audio is preserved independent of the original, fragile medium, so those physical artifacts needn’t be handled to listen. In the case of the Welles collection, this is especially important. Once World War II began, rationing dictated that the aluminum base for lacquer-coated discs be changed to glass—all the more fragile. Thankfully, MDPI experts went through the often-painstaking process of handling the discs so that listeners won’t have to. Careful handling is just one aspect of MDPI’s meticulous process. 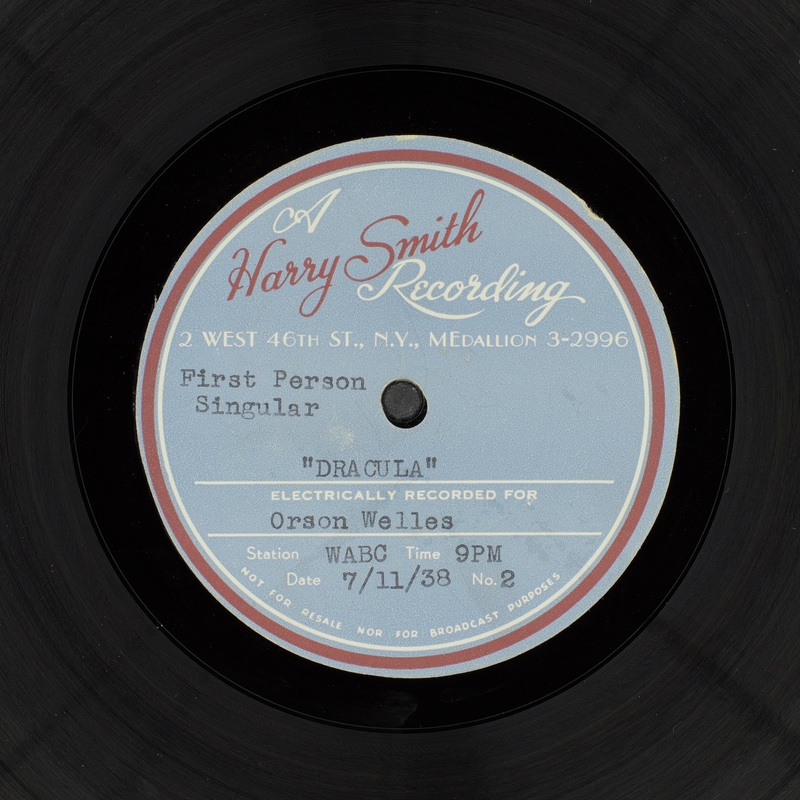 In the Welles collection, each show was recorded on 78rpm discs with only about five minutes per side, 10 to 12 sides per program. 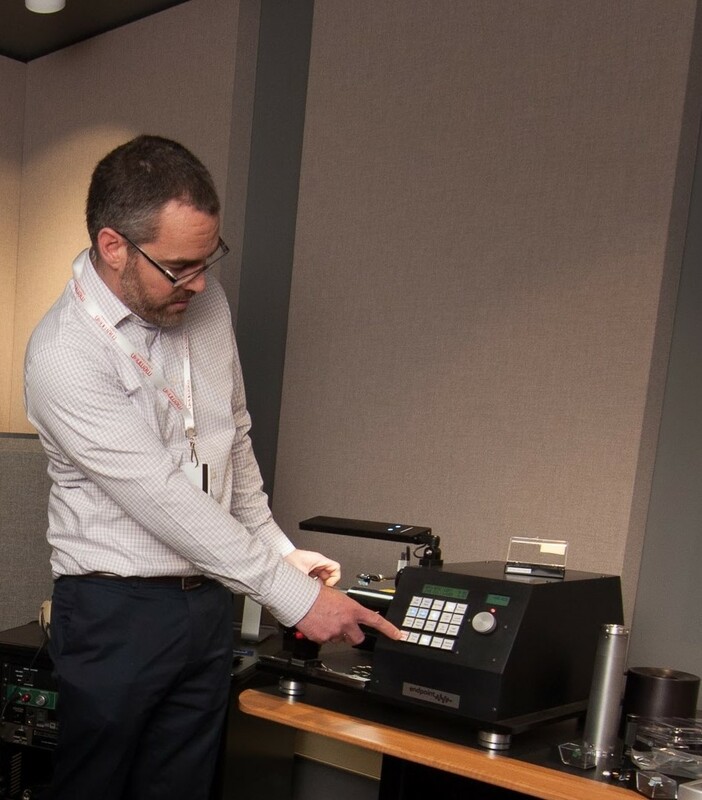 When they arrive, AV specialist Jonathan Richardson groups them, cleans them, and dries the lacquer on a turntable specially designed with a small vacuum. He then studies the grooves under a microscope to recommend a stylus size. 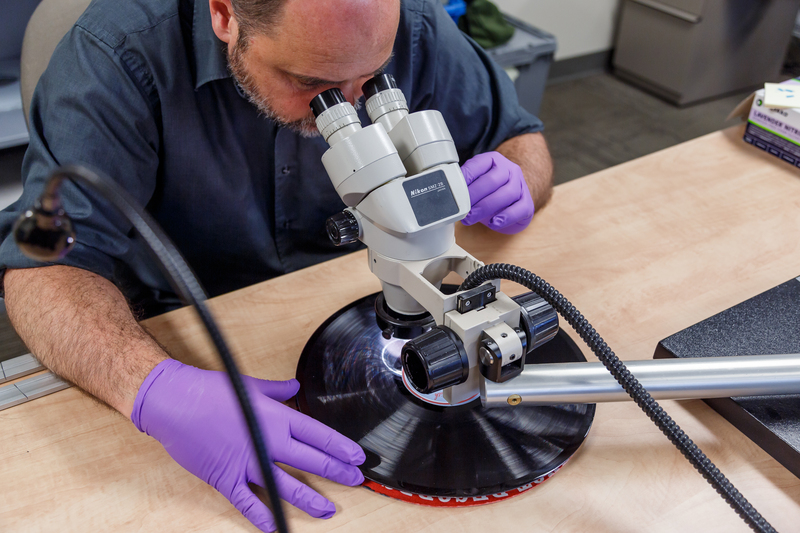 Audio Visual Specialist Jonathan Richardson inspects grooves on a lacquer disc. 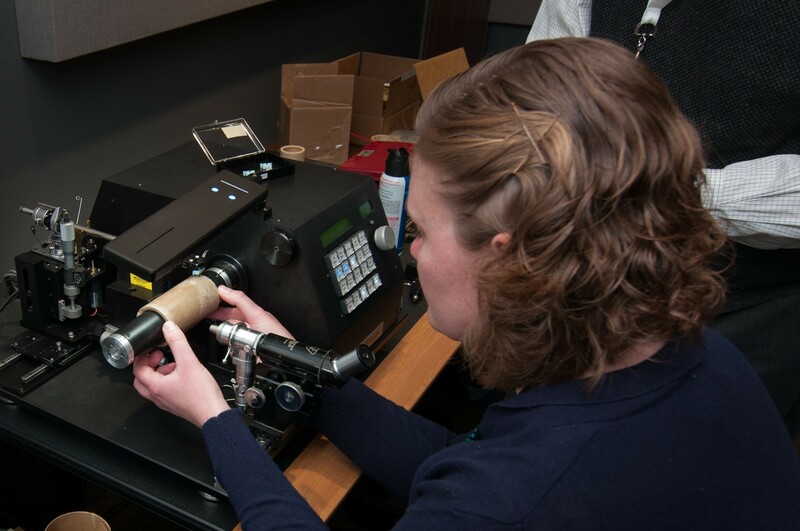 The discs are transferred to the audio studio, where Figurelli or fellow audio preservation engineer Melissa Widzinski measures the distance from the spindle (which fits the disc center hole) to the first inner groove and the outer groove of each record, using that ratio to determine the best placement of the tone arm, which holds the stylus. This minimizes tracking error even before the disc is on the turntable—a Technics SP15 vintage direct-drive player that can accommodate any standard record speed or size. Next, they run a test playback with the recommended stylus. 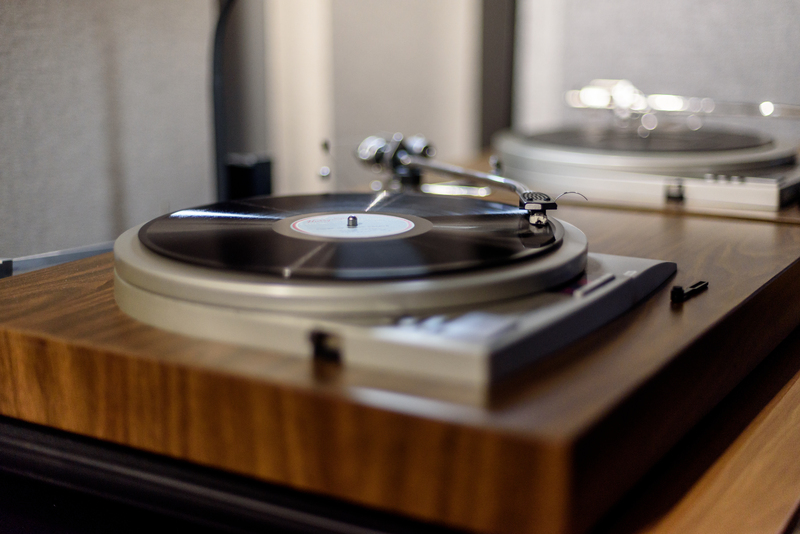 If the grooves are particularly worn down, they can select one of some two dozen custom styli, which range in sizes far beyond those used in consumer record players. “We’re using our critical listening skills to evaluate signal-to-noise ratio, best dynamic range, and to make sure that it sounds the fullest that it can,” explained Widzinski. The turntable plays through a Timestep preamplifier, made by UK vintage electronics specialist Dave Cawley. The preamplifier allows the simultaneous capture of two different sets of files: the unaltered (or preservation) audio, and a high-quality equalized file. To say the least, this isn’t a studio setup you’d find at Best Buy. 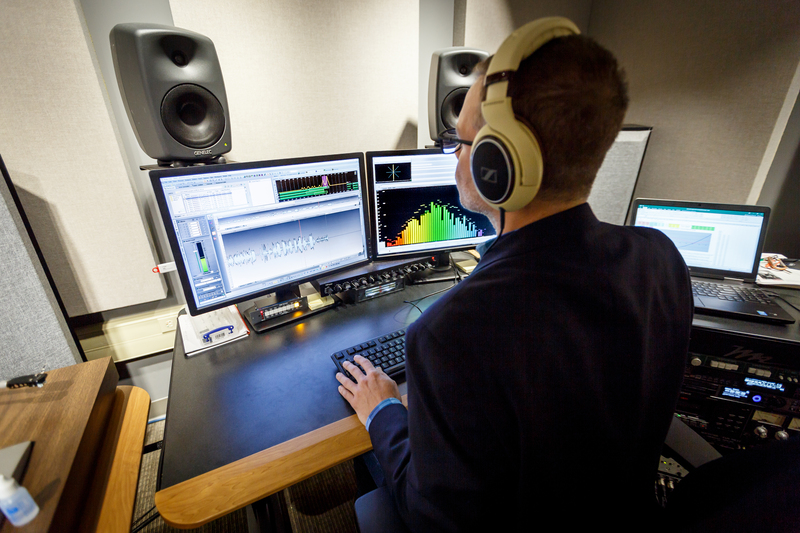 Audio Engineer Dan Figurelli inspects a digital file that has been transferred from disc. Once the recordings are digitized, the files go through a quality control check and an automated post-processing system that creates the MP4s that will eventually be available for the public to stream. The result is that Welles’s radio shows will be available at higher quality and with more straightforward accessibility than ever before. MPDI has finished digitizing the over 300 discs that make up the Welles collection. Now the Lilly Library is scanning the associated scripts, correspondence, and other documentation. The ultimate goal is to make it all available in one multimedia experience online. When the “Orson Welles on the Air” site is finished, readers will be able to listen to the shows and page through their scripts at the same time. It’ll be an enlightening experience: hearing Welles’s genius the way it would have sounded live on the air, while getting a behind-the-scenes peek at his often extemporaneous process. Most importantly, thanks to advocacy from the Library of Congress Radio Preservation Task Force and funding from the National Recording Preservation Foundation, “Orson Welles on the Air” will restore the radio legacy of one of the most influential media figures of the 20th century: reintroducing the lesser-known Welles to the world. Listen to an excerpt from “Dracula” from The Mercury Theatre on the Air. Originally recorded July 11, 1938. Digitized from lacquer disc at Indiana University’s Media Digitization and Preservation Initiative. What do Rugby, software development, and media digitization have in common? The answer is scrum. 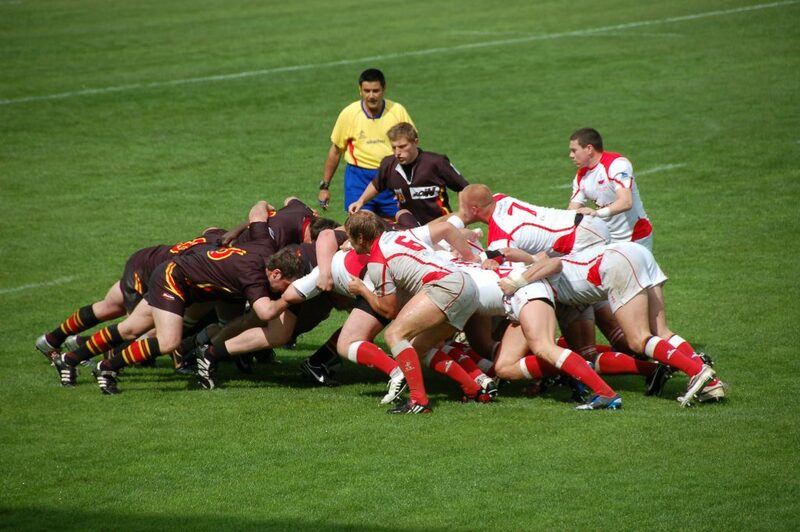 in rugby, the act of restarting play after an infringement when the two opposing packs of forwards group together with heads down and arms interlocked and push to gain ground while the scrum half throws the ball in and the hookers attempt to scoop it out to their own team. In hopes of minimizing “disorderly struggles,” IU Media Digitization Studios (the IU digitization facility known as IUMDS) adopted and adapted scrum principles and procedures to help manage its operation. In this case, scrum is a framework for tackling complex projects that was originally created for software development, particularly what is known as Agile development. IUMDS was looking for ways not only to track recordings to be digitized but to support choice, foster investment and engagement, encourage productivity, keep morale high, and nurture a culture of continual improvement and flexibility. We did not rigorously adopt everything from scrum as used for software development. Below is a discussion of some of the facets of scrum that helped us reach our objectives. In scrum, time is divided into short work units known as sprints. IUMDS uses sprints that are two weeks in length. Every two weeks staff gather for a sprint meeting in which we evaluate the previous two weeks of digitization work and plan for the following two weeks. Our discussions focus on what went well, what didn’t go so well, and what’s holding us back or limiting our ability to work efficiently. The backlog of recordings to be digitized is populated by the MDPI director of technical operations who, in consultation with the Libraries and the MDPI media preservation specialist, chooses the formats and/or collections that IUMDS is working on at any given time. However, audio and video engineers choose what they wish to commit to for the upcoming sprint from the existing backlog. For example, an audio engineer may be feeling particularly sanguine at a sprint meeting and wish to tackle Scotch 175 tapes that are squealing, in which case she assigns Scotch 175 batches to herself for the next two weeks. Digitization work can be tedious. Think weeks and weeks of 90 minute audio cassettes in a language that you don’t understand. Or years of lacquer discs that must be preserved. Having the ability to choose the specific recordings that you work on provides some measure of control. You can then focus on your two-week commitment and not on an endless future of, say, lacquer discs. It is the satisfaction of small task completion–successfully meeting two-week targets is satisfying and feels like (and is) real progress. All of these have a positive impact on morale. This post continues with part 2. Agile software development is an umbrella term for a set of methods and practices based on the values and principles from the Agile Manifesto created in 2001. See https://www.agilealliance.org/agile101/ Scrum is one of a number of Agile methodologies. This is a continuation of a post discussing the use of scrum procedures to help manage a media digitization operation. In part 1 we explored how scrum influences time, choice, and morale. In part 2 we begin with ideas related to a philosophy of continual improvement. In addition to the biweekly sprint meeting, IUMDS staff gather first thing each morning for the daily scrum or standup meeting. This meeting lasts from five to fifteen minutes and includes all staff, not just those engaged in digitization. Sometimes we take the classic scrum approach and everyone takes turns briefly stating what they worked on yesterday, what they will work on today, and whether they see any issues or problems. Often, it’s more like a rugby scrum where anyone, in any order, brings up issues or updates for the group to consider. We are careful to move discussions that will take longer than a few minutes or will dive into the technical weeds of a problem to a smaller breakout meeting either immediately following the standup or at some later time. The daily standups along with the biweekly sprint meetings provide built-in frequent feedback loops for both technical staff and administration. Any given staff member is typically just a day or weekend away from soliciting and receiving guidance on an issue. Administrators always know where things stand and don’t have to drop in on staff in the middle of the day in order to learn what they are working on. In addition, these meetings enable us to change directions or tweak something quickly, providing flexibility to the operation. IUMDS uses a software application called Jira to maintain and track the backlog of recordings to be digitized. Jira is widely used by software development teams that follow an Agile process. Incoming recordings are divided into groups or batches based on technical characteristics so that digitization engineers may realize efficiencies from working on like items. In software development, items added to the backlog are written in a story format and the development team assigns points to each story representing how much coding work they believe it will take to complete each story. This provides a measure of the productivity of the team for any given sprint or sprints. More points equals more work done. Our situation is a bit different. Productivity in a media digitization workflow is measured largely by the number of hours of source recordings that are successfully digitized during a sprint. Therefore, we calculate the playback time of each batch and use this number for story points in Jira. So far, this is working more effectively for audio than for video as the prep process for audio recordings in our workflow more readily lends itself to estimating duration. For video we are currently using the less accurate measure of the number of tapes digitized. Note that a full set of statistics that includes video durations is collected as part of a separate process that runs post-digitization. In our experience, adopting scrum has enhanced team communication as well as provided flexibility to quickly adapt to emerging realities. It positively affects investment, engagement, and productivity. In rugby terms, that’s as good as a try! In rugby, a try is a way of scoring points where the ball must be in contact with the ground in the opposition’s goal area as well as touching the attacking player. Obsolescent media generally proves to be an unpleasant obstacle when working with archival patrons. The professional equipment needed for playing back VHS, let alone formats such as open reel video, has become next to impossible for individual archives to obtain and keep operational. In addition, the limited descriptive information provided by the original creators can make it difficult to determine the content of a tape. This often results in a Catch-22: how do archivists verify what is on a tape without digitizing it and how do they know whether it’s worth the often high cost of digitization without really knowing what’s on it? Much of this dilemma has been resolved by Indiana University’s Media Digitization and Preservation Initiative (MDPI), and the Black Film Center/Archive’s patrons are already reaping the benefits. 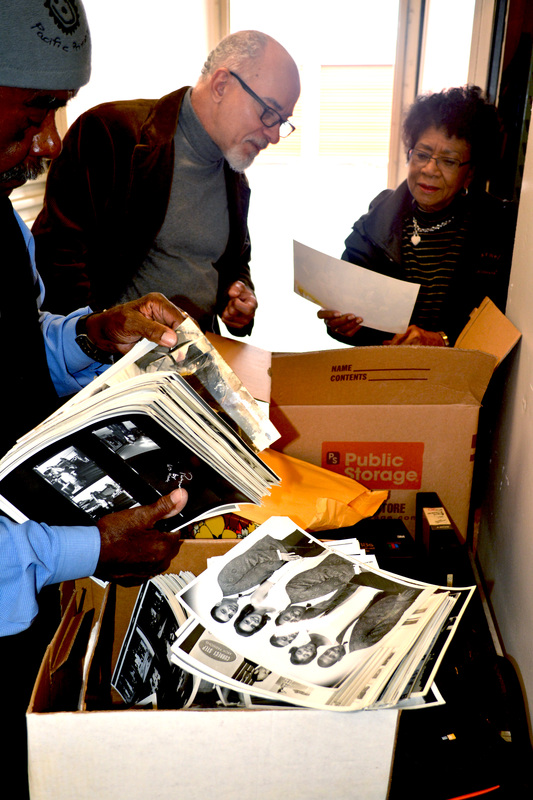 In January 2015, award-winning African-American broadcast journalist Belva Davis and photojournalist Bill Moore donated their footage from the Black Filmmakers Hall of Fame (BFHFI) Archives to the BFC/A. From 1974-2003, the BFHFI acknowledged, supported, and inspired thousands of African American filmmakers and artists and hosted hundreds of events. Its inductees and awardees included figures such as Sidney Poitier, Lena Horne, Spike Lee, Sammy Davis Jr., Danny Glover, Maya Angelou, Gordon Parks, Melvin Van Peebles, and many others. The U-matics, Betacams, and open reel video in Davis and Moore’s collection document nearly thirty years of the BFHFI’s Oscar Micheaux Awards Ceremony and outreach events. 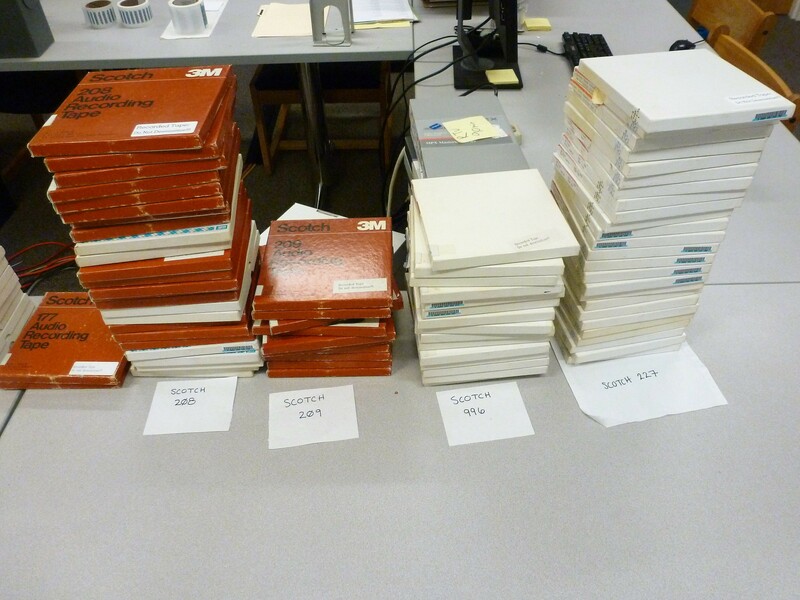 Upon receipt, the tapes were quickly processed by the BFC/A staff and sent off to MDPI for digitization. The turnaround from donation to digitization used to take many years if it happened at all. When Moore and Davis paid a visit to IU in May 2016, they were delighted to find that we could already stream much of their material for them, some of which they had lacked the means to play themselves for decades. Through MDPI, we were able to demonstrate IU’s commitment to the preservation of their donation and the BFHFI’s legacy. They also were delighted by MDPI’s facilities, the Auxiliary Library Facility, the IU Media School, and listening to the Archive of African American Music and Culture’s new podcast series, the Golden Age of Black Radio. More recently, MDPI and the recordings donated by Davis and Moore from the BFHFI Archives laid the groundwork for another magical afternoon. Filmmaker Julie Dash visited the Indiana University campus from December 8th-10th 2016 to participate in a series of events related to the premiere screening of the 25th Anniversary Restoration of her landmark film, Daughters of the Dust at the IU Cinema. On the first afternoon, Julie joined the BFC/A staff to view the footage of her receiving the BFHFI’s International Black Independent Film, Video & Screenplay Competition Best Film award for Daughters of the Dust during the 1992 Oscar Micheaux Awards Ceremony. The screening touched not only Julie, who expressed her gratitude for the opportunity to relive the memory and to reminisce about friends she hadn’t seen in many years (some now deceased), but also a number of graduate students who had been unaware of the BFHFI’s activities and its importance. In addition to helping us strengthen our relationships with donors and visiting filmmakers, the work done by MDPI has proven valuable for supporting classroom pedagogy, providing scholars and filmmakers with research and production materials, and pitching projects by documentary filmmakers and film score composers. 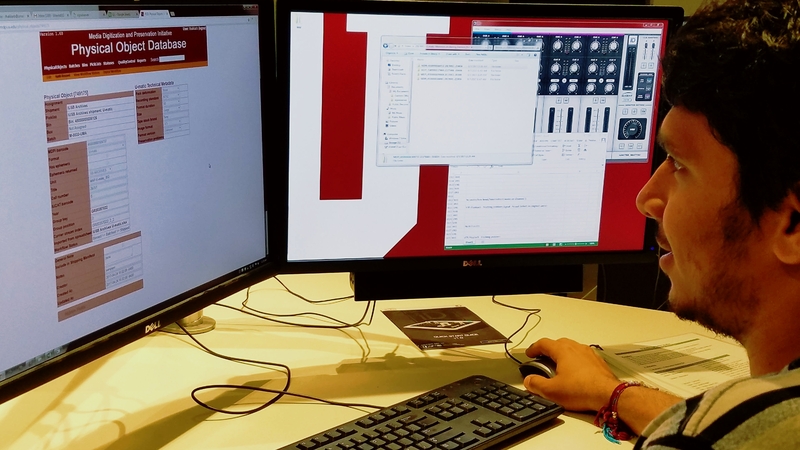 Given that the cataloging and user interfaces are still in the initial stages of development, it will be exciting to see what future opportunities MDPI has in store for both audiovisual archives and their patrons. While MDPI is well on its way to digitally preserving IU’s significant audiovisual collections, access is an equally important, and equally challenging, goal of the initiative. There are many dimensions to online digital access—rights, policies, description, discovery—but before any of these come into play, one needs to have a technology platform that can effectively support access to audio and video. Thankfully, IU has a great deal of experience in providing online access to audio and video collections, going back to the Variations digital music library, which went online in 1996 as one of the very first web-based audio streaming platforms, and was subsequently developed into open source software adopted by a number of other universities. In the mid-2000s, IU worked with the University of Michigan to create the EVIA Digital Archive, a scholarly access platform for ethnographic field video developed in the mid-2000s. Since 2011, the IU Libraries have been working with partners at Northwestern University to jointly develop the Avalon Media System, with support from a series of grants from the Institute of Museum and Library Services and Andrew W. Mellon Foundation. Avalon is a free open source software platform designed to make it easier for libraries and archives to provide access to AV collections for a wide variety of use cases and is the access system that we are planning to use for MDPI. Currently at IU, our main public instance of Avalon (known as Media Collections Online) continues to support access by Jacobs School of Music students and faculty to the music sound recordings formerly delivered via Variations. 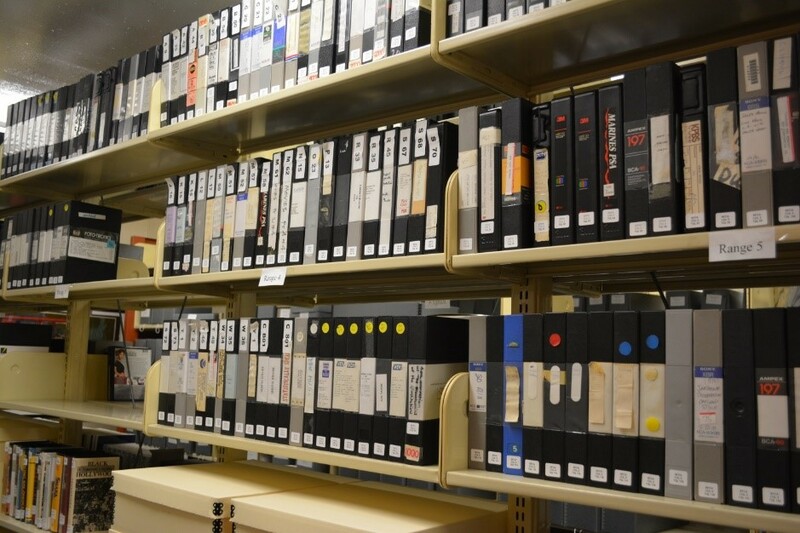 However, it also serves the access needs of many other AV collections, including archival films from the IU Libraries Moving Image Archive, oral histories from IU Southeast, Herman B Wells home movies from the University Archives, juvenile justice documentary footage, and selected field collections from the Archives of Traditional Music as just a few examples. Avalon was developed using the Ruby programming language and is based on a technology stack that is becoming more and more familiar to libraries and archives: the Samvera software development framework, Blacklight discovery interface, and Fedora digital repository. It allows staff at libraries and archives to easily load audio and video content, create descriptive and structural metadata for that content, and make content available for discovery, listening, and viewing as widely or as locked-down as is necessary in order to comply with copyright and other restrictions. We have designed Avalon, now in its 6th major release, to be easy to install and configure, and several libraries are now using it for their own media access needs, including Northwestern University, the University of Virginia, Yale University, Calvin College, Washington University, and the University of Alberta. As part of the Samvera Community, a group of over 30 partner committed to working together to develop open source digital repository solutions, Avalon welcomes code contributions from other adopters, though this is by no means required in order to use Avalon. To help extend Avalon’s benefit to an even greater number of institutions, IU and Northwestern are currently working with LYRASIS and DuraSpace to develop a cloud-hosted “software-as-a-service” offering of Avalon that will allow libraries and archives to adopt the system without needing to have the in-house technical expertise and server capacity to set it up locally. LYRASIS will manage the system in Amazon Web Services, and media content will be ingested via DuraSpace’s Duracloud cloud storage service. A pilot of this hosted Avalon offering is expected in the Fall of 2017. In future blog posts, we will dive into more detail on how specific features of Avalon are being leveraged for MDPI. In the meantime, for more information on Avalon, please visit the Avalon website or feel free to reach out to the Avalon team.